This battery cable repair kit provides all the needed items to repair or create, and seal your battery cable to terminal connections. The kit contains 90 pieces of 24 different items including liquid flux to insure a good solder connection. 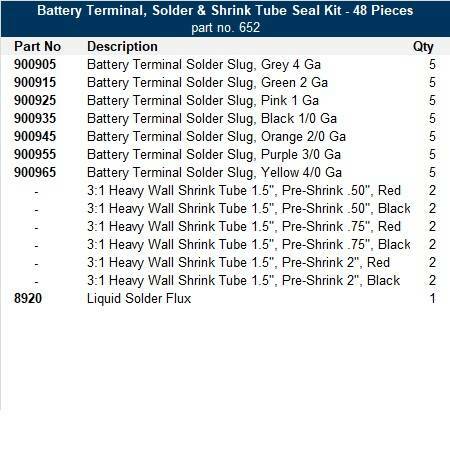 Battery terminal seal kit provides all necessary items to repair/create and seal your battery cable to terminal connections. Kit contains 90 pieces, 24 different items including a bottle of liquid flux to insure a good solder connection. Battery terminals in 1-2, 1/0 & 2/0 gauges and 3/8" battery lugs in 4, 2-1, 1/0 & 2/0 gauge also color coded to industry standard. Solder pellets that are color coded to industry standards in 4, 1, 1/0 & 2/0 AWG and have a melting temperature of 182°. The black and red heat-shrink is dual wall 3-1 adhesive lined, cut in 1.5" lengths in ½", ¾" and 1" I.D. sizes. All are packaged within a gray metal scoop box (18" x 12" x 3"). The battery terminal seal kit has everything needed to securely seal your battery cable to terminal connections. Inside are 48 pieces of 14 different items including liquid flux, solder pellets, and dual wall heat shrink tubing. Battery terminal seal kit provides all necessary items to seal your battery cable to terminal connections. Kit contains 48 pieces of 14 different items including a bottle of liquid flux to insure a good solder connection. Solder pellets are color coded to industry standards ranging from 4 AWG up to 4/0 AWG and have a melting temperature of 182°. The black and red heat shrink is dual wall 3-1 adhesive lined, cut in 1.5" lengths in ½", ¾" and 1" I.D. sizes. All are packaged with in a durable, lightweight translucent carrying case (11" x 6-3/4" x 1-3/4").